Disclaimer: I’ll only make recommendations based on my own experiences and sometimes earn a referral fee through affiliate links which pay for the coffee that fuels this blog. It will never affect the price you pay. When you think of Venice, the first thing that springs to mind is the vast system of canals that connect the city’s 118 islands. You might also think of the 400+ bridges, the symbolic gondoliers or the carnival that attracts millions of people every year. You may not think of beautiful sandy stretches, but last summer I set off on a journey to discover the unsung beaches of Venice. I headed to Lido, an island across the main lagoon, where I found a huge beach looking out across the Adriatic Sea. Here is what I found. Where to find Venice’s beach? The main beach in Venice, Italy is officially known as Lido de Venezia although often referred to as Lido Venice or Lido Beach. As well as 11 km (7 miles) of sandy beaches, Lido is also home to lots of green areas and many stunning hotels. Lido beach sits the other side of the main lagoon, so the only way you can visit is via boat. Luckily this is Venice, so it was very simple using public transport. Line 5.1 – This waterbus goes around the city anticlockwise and takes just over 30 mins to get to Lido from Piazzale Roma. Note – If you’re returning to Piazzale Roma, take line 5.2 which runs in the opposite direction. If you go in the wrong direction it will take around 50 minutes each way. Line 6 – This is an express waterbus that also circumnavigates the city although runs less frequently. It will take just under 30 mins to reach Lido. Line 1 – If you fancy seeing the sites of Venice on the way you can take Line 1 which runs straight up the grand canal, this will take about 60 minutes to reach Lido and being the main water bus route it will get very busy. Line 1 – This takes about 20 minutes to reach the Lido from San Marco. Once you arrive at the main waterbus station Lido S.M.E, it is about a 10 minute walk to the beaches. 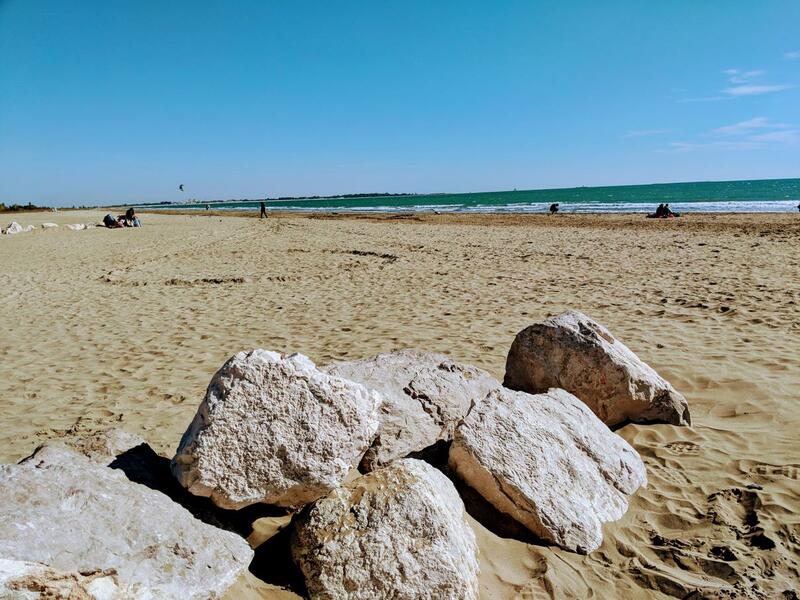 The Lido beaches span for 11km along the Adriatic Sea, the beach front along the sea is free to access however there are also many beach clubs along the stretch of sand. The main beach club, Blue Moon, is also free and has a (limited) bar and café, toilets and showers. However, most of the beach club charge for access to certain areas. You can usually hire deck chairs and umbrellas or some of the more upmarket clubs offer beach huts which you can rent for the entire season. These are sometimes offered for free or at discounted prices if you’re staying in a hotel along the beach. One of my favourite reasons to visit Venice Lido beach is to escape the hustle and bustle of Venice’s main centre. Venice is known to be over crowded, especially during peak seasons yet the beaches are relatively unknown so you’ll get some much deserved peace and quiet with the sea breeze and away from thousands of selfie sticks. As well as visiting the beach, I can recommend exploring the rest of Lido. Its got a great local feel with many family businesses and some beautiful green areas too. Cycling – Unlike the main city of Venice, Lido has roads and is great for cycling, there are a few places offering bike hire near to the main waterbus station. Film festival – If you’re visiting in early September, Lido becomes a centre of activity as it hosts the Venice International Film Festival – the oldest film festival in the world. This takes place in the historic Palazzo del Cinema which is right near the beaches.